The Coffee Lounge is located adjacent to Tropics Day Spa in the same building and can be enjoyed by all, with or without a spa visit. 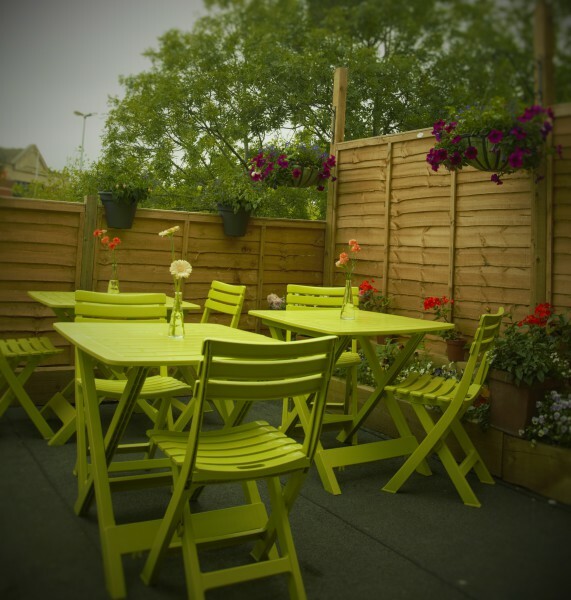 It provides a relaxed and friendly environment with seating inside and out on the roof terrace. We offer a comfortable warm space with contemporary decor and serve delicious Lavazza coffee, cold drinks and mocktails, with a selection of fresh home-made cakes. Decorated in contemporary style, the 70's retro furniture and gentle Jazz make this a perfect location for a work get together, meeting with friends, to enjoy on a date or just to chill, maybe after using our Gym or the sauna. During the day we also offer a light bites menu which includes Pizza, Calzone and Piadina. Tuesday to Saturday evenings we run an informal supper club style dinner menu. Our dishes are heavily influenced by the Italian style of cooking brought to us by Marco Forgione. However we have fused new ideas with the traditional recipes to create food that is a little bit different. So if you are looking for somewhere individual, serving artisan food lovingly prepared by an energetic and passionate team, we are the place for you. Sunday lunch will be available in the future, by advance booking.